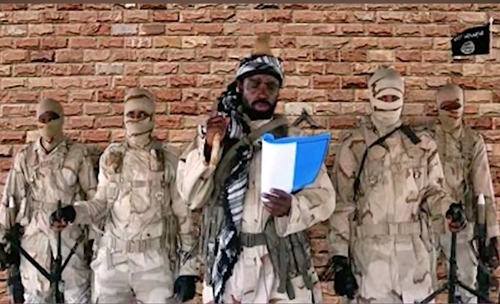 In a new video clip released online, Boko Haram leader, Abubakar Shekau, has taunted distraught parents of the abducted Chibok schoolgirls, telling them to accept the insurgents as their sons-in-law. “Oh you people of Nigeria, Chad, Niger and Cameroon, here is my message to you all . The God that created all of us and enjoined us in His holy book, just as he sent it through our holy prophet, Muhammad (peace be upon him) gave him the instruction to say that Allah has sanctioned mankind this straight path and make clear this path that does not lead one astray. This path is the only path prescribed to all mankind in the world. May God take our lives on this path. “The government of Nigeria cannot end what we are doing; they can only die trying. "Particularly you the people of Nigeria and government of Nigeria; please stop deceiving yourselves about what you cannot achieve. You cannot stop us. And stop following the path that is not right. “God has instructed us to catch whoever that is not following our path and detained such persons in our prisons, or we could set him free and let him go ; or we could as well take our revenge on their lives. Whatever we see in the holy book is what we do. We don’t look elsewhere. “That is why we hold unto the Chibok girls; that is why we still have the police women. Among the Chibok schoolgirls that insisted on following the ways of their parents’ religion, we allowed them to go back and joined their people. And here with us we have the police women who have not converted to Islam and we are not going to force them to do so. They are here begging for you to come release them. “But for the remaining Chibok girls, you can’t get them again because they have all accepted and understood the religion of God. They did not accept Islam because of us; who are we to force them? That is why we say our ways is not that of the mortal being, but that of God. 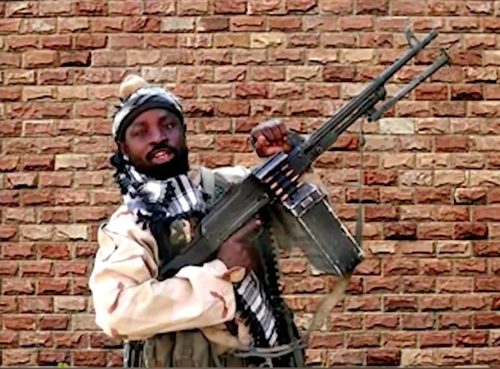 “You have said that I, Abubakar Shekau, is tired and unhealthy. But you forget that no one gets tired on the path of God. I am still strong and ready to carry on the work of God. That is why the Chibok schoolgirls, who have gone through the western education, are today following the book of God, because they have come to understand that the constitution is not the right path but a deception. "They have now realised that your laws in Nigeria is not for good for them. It is written in the first article of your constitution that the constitution takes precedence over and above any other law book including the holy books. 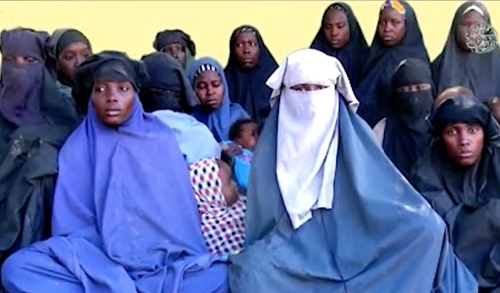 But how come these Chibok girls still come to accept the laws and constitution of God? “You use to teach children in iyour schools to say ‘I pledge to Nigeria my country, to be faithful loyal and honest, to serve Nigeria with all my strength, to defend her honour and glory’. Is that not what you teach your pupils? “It is still the same you that ask the children to sing “Arise O’ Compatriots, Nigerians call obey. To serve our father land, with love and strength and faith, the labor of hour heroes past shall never be in vain…”. Is that not what you teach our young children in school that they should not allow the labour of past leaders to waste in vain. "Do you think all the prophets of God will allow that to happen? Never! “President Buhari you are now 76 years old, but let me tell you that many like you have attempted fighting the soldiers of God in the past and they are destroyed. I swear by Allah that you cannot defeat us. That is how you come to tell all kinds of lies. But God knows that his faithful servants cannot be ridiculed before his enemies. The Chibok girls that have become Muslims, and got married peacefully, are even calling on your parents to come accept Islam. May God bless you all. And we call on the parents of the Chibok girls that have become good Muslims to accept our ways and be part of us. You have become our in-laws by the virtue of your daughters marrying us. We are now in-laws. We are not fighting with the people, but those that stand against God’s commandment. That is why we reject your books and constitution. That is why I have said it in the past that ‘No rule and regulation in the world rather than Quran’. “We still have the policewomen and here are they crying for help. For all that we do, we do for the sake of God. That is why various of our brethren who go out to detonate bombs do so for God’s sake and not for our sake. The government should stop telling all these lies, especially the elders of Nigeria. Many elders have lied and did not end up well. “The military have come to us but did not end well. That is why your helicopter went down, that is why your armoured tanks got destroyed, that is why your armored trucks from Cameroon did not return. We killed many of you and you took their corpses to conceal the truth. “This message is from me Abubakar Shekau and it was released on the day that coincides with the Sunday 14th day of January 2018 in the Islamic calendar”. “Oh you our parents in Nigeria, I call on you to repent and worship Allah. We are very happy because we have found a way to Worship Allah. It is Him alone that we worship here; do repent and come to worship your creator. We pity you our parents that you have not accept the ways of Allah. You are only worshipping the country and its constitution. What a pity. It is ignorance. “It is even funny that you want the government to come and set us free and take us away. If you come to take us, where will you take us? Back to the land of infidels? God forbid! May God spare us from that your land of infidels. Don’t ever hope that we will ever go back to you. Our hope is to go and join our creator. We are the Chibok schoolgirls and we have come to stay here because here is where we belong, so don’t ever think you will see us again. “We pity the other girls who refuse to accept but rather chose going back to Nigeria, after God has given them His grace and brought you to the caliphate. You chose to return to infidelity. You girls will come to regret your actions. You will surely regret it on the day of judgment. Any persons that is in Nigeria and worships the constitution has only one destination which is hell fire. Repent today and worship God. “Assalamu alaikum to the people of Nigeria, here we are in the captivity of Boko Haram. Since our abduction we have been kept alive and well. But our plea is to the president of Nigeria and his vice president to have mercy on us and help us out of here. “We are Nigerian citizens and we plead with you to come and rescue us just as you had promised to do in the past.